Copyright: Artists retail their rights to submitted art works. 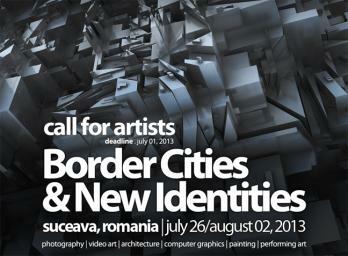 Border Cities & New Identities – International Art Festival of Architecture, Photography, Video Art, Computer Graphics, Painting and Performing Art, held in Suceava (Romania), at The Water Plant “Uzina de Apa” – Center of Architecture, Urban Culture and Landscape, from the 26th July to 02nd August 2013. Send your works submissions with a CV/biography, some samples of works (only for artists) via email to [email protected] or via mail. The number of works you can submit is unlimited.